Like many cities, some of the best stuff is beyond the ‘idea’ of the city and the main tourist spots – and this is true in DC too, especially when it comes to food. Here were a few of our favorites from our recent trip along with some good wanderings to do between meals. 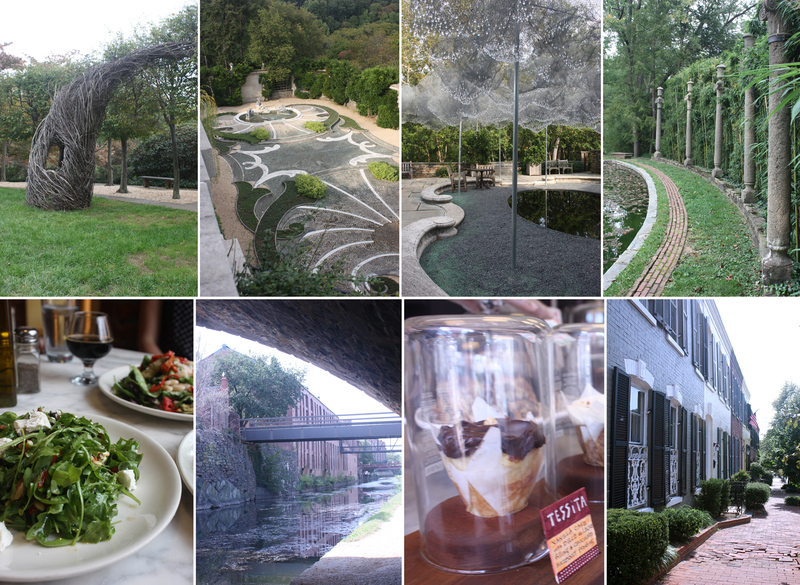 Dumbarton Oaks Garden – (above, top row) One of my favorite spots of the trip! Designed and implemented over 30 years beginning in the 1920’s, this is an amazing series of outdoor rooms – formality interspersed with more naturalistic elements. So many great spots to contemplate – my favorite was the Fountain Terrace (above, top right). Pizza Paradiso – there are a few locations of this restaurant in DC, but we happened to be in need of a lunch after our wanderings when we found our way to the Georgetown outpost. A lovely arugula salad (above, bottom left) hit the spot for me after a string of a few rich meals, but a Panini Grosso made a certain fella at my table pretty happy. The C & O Canal – I was fascinated with this engineering feat of the 18th century – the Chesapeake & Ohio River Canal system. This transportation system was what moved coal and agriculture down to market from points north and west. Its story of competing with other transportation modes changed the landscape and towns of the Potomac upriver dramatically. A stroll along the canal tells a bit of the story – but is also a nice spot of removal in the city (above, bottom middle left). Baked and Wired – a lot of attention seems to be paid to Georgetown Cupcakes due to an apparent TV show following said business, but Brian and Becky swear by Baked and Wired instead – and they did not steer us wrong. We tried the Tessita (above, bottom middle right) – vanilla cake with dulce de leche filling and chocolate-hazelnut icing – dang! Toki Underground was another favorite of the trip. This noodle house is on H Street and offers giant bowls of ramen (I went with the kimchi version – yum!) and a variety of dumplings. I found the few subtle southern nods charming – pulled pork instead of pork belly and collard greens instead of seaweed – but otherwise this was all Japanese in a great hideaway space. Good list of sakes as well. Zaytinyna – a celebration of Turkish, Greek and Lebanese by Jose Andres – this Chinatown restaurant offers tapas style plates (above, left). I love going to these types of spots so that I can try 10 different things and really get a sense of the restaurant. Everything was perfectly prepared – this was an incredible meal on our last night in the city. Proof – a lovely spot for a break and a beverage when wandering – across from the National Portrait Gallery. Taylor Gourmet – there are a few outposts of this superior sandwich shop around town – we happened to go to the Dupont Circle location (above, top left). Incredible sandwiches – ours was a Pattison Avenue with roasted pork and broccoli rabe and provolone (above, top middle left). Share a sandwich and a side of risotto balls – and a Boylan fountain soda will complete a great lunch. Amsterdam Falafel – This Adams Morgan (neighborhood street scene – above, top right) spot happened to be a perfect late night snack during my visit. Crispy and delicious made-to-order falafel balls are handed to you in a pita. Don’t forget to ‘crush your balls’ so you can maximize your choices from the multitude of toppings and sauces that you can add to your heart’s content. Etete – when I was prepping for this trip and asking folks about their favorites in DC, many people said “eat Ethiopian – DC has some of the best”. Brian and Becky have a few that they debated but decided on Etete on U Street as the spot for us to gather around several platters of many tasty things scooped up with spongy injera bread. Washed down with Ethiopian Tej wine and beer – a lovely event food evening. American Ice Bar – After our meal at Etete, we strolled over to this nearby spot (above, bottom right) for some outside beer garden sitting, a great place for sipping a bourbon drink from a mason jar. 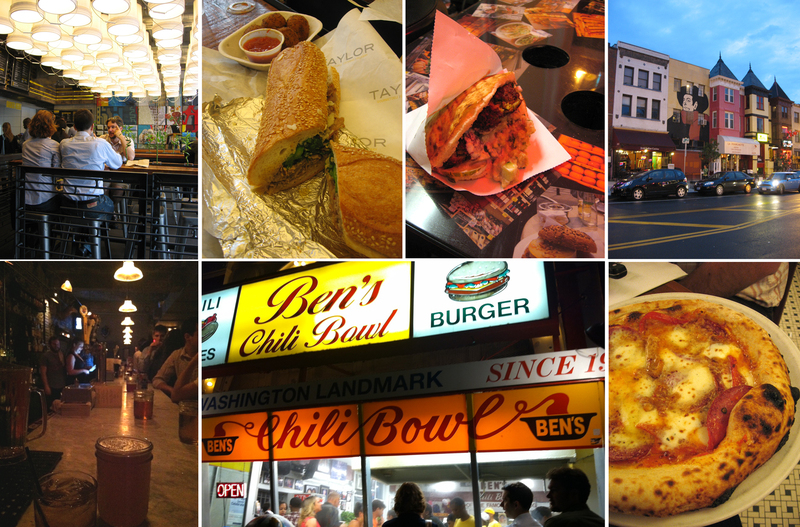 Steps away from the iconic Ben’s Chilli Bowl (above, bottom middle) that we unfortunately will have to save for our next visit. Two Amy’s – Brian said it is his favorite pizza in the US – and I am not arguing – the Norcia (tomato, salami, grilled peppers, fresh mozzarella, grana – above, bottom right) was so incredibly good, we ordered another one mid-way through the meal. No surprise that this has the official certified Neopolitan Pizza status. After all that eating and drinking, we definitely needed the counterpoint of lots of walking. The best places for that – and for an amazingly quick and close bit of nature was Rock Creek Park. Amazing trails that feel far in the woods right in the midst of the city (above, middle left). There are also a few great spots of history in the park – like Pierce Mill, built-in the 1820’s, but recently refurbished and in limited operation. The guys had a very thorough tour from one of the docents there (above, middle right). The National Zoo is also adjacent to Rock Creek, and the entrance was just a few steps from Brian and Becky’s place. Seeing animals always makes me happy – the frolicking otters were so dang cute (above, left) and it was great to see the National pandas (above, left). All of this (and part 1) in just a week! It was a great trip and visit with our buddies – thanks so much to Brian and Becky!